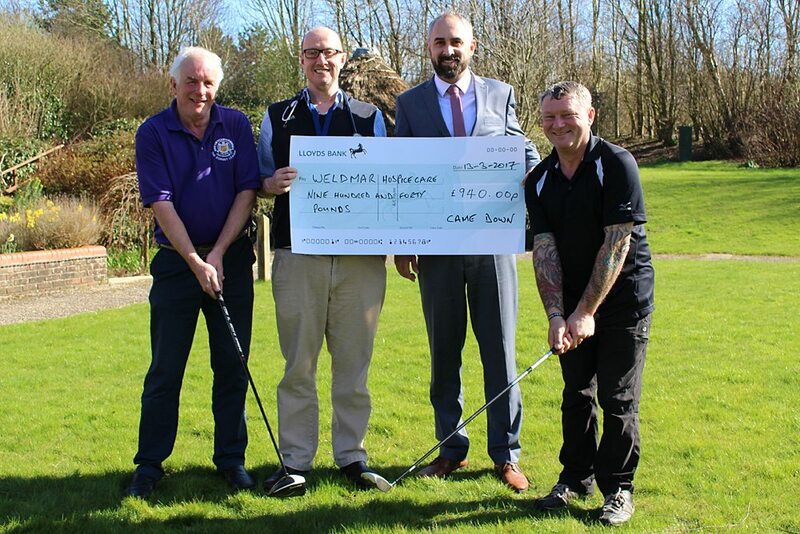 Representatives from Came Down Golf Club in Dorchester recently visited Weldmar Hospicecare to present a cheque for £940 on behalf of the Dorset League. The Dorset League is made up of nine county golf clubs, who play throughout the year in a league competition. The proceeds from this competition are donated to charities across Dorset. Ricky Symes, Captain of Came Down’s Wagglers Section, said “We are proud to be able to support Weldmar Hospicecare. This year’s donation has been made more poignant as a recent Came Down Dorset League captain, Bim Downes, has sadly passed away from a cancer related illness”. Caroline Hamblett, Weldmar’s Chief Executive, said “Everyone at Weldmar would like to say a big thank you to all the golfers who took part in the Dorset League competition. We rely so much on our local community to help us fund our services for our patients across Dorset, and would not be able to offer our outstanding services for free without their support”. Photo (from left to right): Peter Thorne (member of Came Down Golf Club), Dr Paul Barker (Specialty Doctor at Weldmar Hospicecare), Matt Fletcher (General Manager at Came Down Golf Club) and Ricky Symes (Captain of Came Down’s Wagglers Section).